Provides improved support and full protection while playing light contact sports. This patented technology was developed to reduce the strain on the ACL by distributing the load placed on the ligament via four points. Click here to learn how the Four-Points of Leverage works. Is the DonJoy SE-4 Brace right for me? Ideal for moderate to severe ACL, and/or CI (Combined Instability), PCL, MCL, LCL instabilities. Can be used during contact sports or daily activities. Try our Brace Advisor for personalized product recommendations to meet your needs! DonJoy SE-4 is ideal for moderate to severe ACL, and/or PCL, MCL and LCL instabilities. It is recommended for use in light contact sports.. The brace features a non-chip outer covering which is also safe for salt and fresh water activities. DonJoy is please to introduce the most cost effective functional ligament knee brace known as the SE-4 Point, with its patented 4-point dynamic leverage system technology. The SE 4-Point has made a name for itself as a strong and low profile brace in the off-the-shelf market. The SE 4-Point provides the basic frame of the traditional legend at a fraction of the cost. Shop Legend SE-4 replacement parts for full kits, straps, and pads. Shop our complete selection of knee braces here. My 16 year old son had an ACL fracture, no surgery was required but the doctor recommended a brace to prevent hyperextending his knee because he has "loose" joints. He does play football so what brace would you recommend to prevent his knee from hyperextending? The SE-4, would be a good brace to prevent hyperextension, but if he plays a defensive position in football, you may want to consider the Armor, https://www.betterbraces.com/donjoy-armor-knee-brace-with-standard-hinge, which is a stronger brace made to withstand more aggressive positions. I am not sure which size would work best for me. I would like to use it for kitesurfing and surfing. Looking to get the CL version for my left knee. Is it strong enough to use for football? I have suffered an acute complete tear to my ACL and sprain of MCL. Of right knee. The SE-4 has been recommend ti me. I am trying determine size. My measurement of the of my thigh is 18 1/2, knee is 14 1/4 and calf is 13 1/4. How much adjustment is there on these measurements? Which size should I order? I recently had an ACL reconstruction surgery. I will be resuming crossfit after 2 months after consulting my physiotherapist. I would like your expert advise on the type of brace which will be well suited for me. I would be keeping the level of my training to moderate for at least first 8-9 months. Thanks in advance. After clearance from your physician, to give the maximum support on your knee while doing crossfit, I would recommend getting the DONJOY FULL FORCE KNEE BRACE. It has the FOURCEPOINT HINGE it reduces the amount of time your knee is in an "at risk position", enhances the Four-Points of Leverage by increasing the posterior load applied by the brace on the tibia, and improves your natural gait by applying progressive resistance before reaching a firm end point during movement. Recently had ACL reconstruction surgery, 1 week ago. measuring my knee for the brace is tough due to swelling, should i measure my other knee? unaffected knee about the same except knee is 15.5. I bought a medium and it is too tight on sides of knee should i get a large? The DonJoy SE4 is a brace used more for while you are playing sports after you have had an injury. You would want to look at the DonJoy Trom Advanced Knee Brace as this will keep your leg immobilized at the degree that you want. Also, you will want to use the measurements from the affected leg. How do you adjust the angle in which your leg can extend? To adjust the angle of a SE-4 Knee Brace, extension stops would have to be requested from a local sales representative. I am a runner, putting 40 miles a week.....would this brace slide down for long runs or after a time of usage? do to the sweat etc.. I work in manual labor all day for 10-14hrs a day. I have a stage 3 MCL and a stage 2 PCL tear, I'm trying to prolong surgery for as long as possible due to the extensive recovery time and rehab time. Will this brace give me back the mobility to where I could move freely again without the fear of my knee buckling? Fractured my right kneecap. Not displaced. Would this type of brace be appropriate/helpful in keeping leg straight? Is it designed to be adjusted for knee movement as determined by orthopaedic doctort? No this brace is considered a Functional(activity, sports) brace. You will need something like the TROM Advanced post-op knee brace. This brace is able to lock in full knee extension(straight) and later can be unlocked and movement allowed in increments. I measured myself and have, k:15", T:21 1/2", C: 14". Can you please tell me what size I should order? I tore my ACL, with no other damage. Should I purchase the ACL or the CI version? Was thinking the CI would give me superior knee support over the ACL version. my question is sizing. im looking at the donjoy legend se-4 knee brace with the (CI). my leg measurements puts me floating in between sizes. thigh 23.4in/59.5cm, mid knee 15.7in/40cm, calf 16.1in/41cm. as you can see this puts me between brace sizes. which size of brace would you recommend? i stand 5'9" at 227 pounds. I have an ACL complete tear and meniscus.....my knee is been trying to get out of place several times. Would it matter if I get the brace for ACL or CI? I have an intermediate PCL tear and a sprained meniscus MCL. I need a brace for skiing. My insurance won't cover the brace so I have a tight budget. Would this brace work for skiing, or is there something better? The SE 4 only comes with a standard calf which is too long for a skier. The Armor with the Standard hinge would be the best option for you. You can choose the short calf which will allow your ski boot to fit under the brace. Hi I had a complete tear of my ACL, partial tear in my MCL and meniscus playing ultimate frisbee. I had reconstructive surgery on my knee in May of 2015. Will this be a good brace for me to go back to playing ultimate frisbee? My measurements are K: 17 C:15.5 T: 21.5. What size should I get. Thank you. I had reconstructive surgery on my ACL and on my Meniscus in October. I'm a senior in high school so I missed my senior season of basketball but I am shooting for track season! Doc says I should be okay for track and said it's up to me if I want a brace. Would the SE4 give me the support I need for both my meniscus and acl? I will be using it for throwing in track and for pickup games of basketball! My measurementsister are thigh 26.5 mid knee 17 and calf 17.5. Which size should I choose? The SE-4 is 16" in length and 21 ounces. It does not come in a shorter length. The Female Force is 15" in leangth and 18oz and the ACL Everyday is 13" and 15 oz but not as good for sports. My measurements are 21"-16.25"-16" what size should I get and does it work with snowboarding? Older CTI Edge brace for ACL, MCL, PCL has worn out and physician recommended this brace. Knee measurements are thigh 19.5", center knee 16.5", calf 16". Should I order medium or large? Both kneecaps were removed in the mid70's--due to congenital dislocation and hyperextension has been normal since. I'd like to limit it (as well as risk of knees pitching me on ny face!) and hike more. Which brace do you recommend? I would suggest any of our rigid knee braces for ACL support. These braces will provide moderate support for the knee for all instabilities. The braces have bilateral hinges for medial and lateral support, and the Four points of Leverage strapping system protects the ACL and PCL as well. These braces have combined support to give the knee a stable feel. I have a partial acl tear. Would this be the best for skiing and hiking? Also, measurements are: thigh 18.75", knee 14", calf 12.5" - should I go with a small or medium size? Thanks for you help! I partially tore my ACL, MCL, & Meniscus. I play football and basketball, Which brace would you recommend? so i torn my menicus and im returning to play lacrosse this spring wold this help me to run faster? The SE 4 Knee brace will provide support for the knee and help to prevent further injury but will not help you to run faster. I had osteosarcoma in my left knee. Osteosarcoma is a bone cancer, I lost my whole knee and 3/4 of my quad. I have a divot right above my knee, it goes in about an inch. I am just wondering if you've dealt with anything this bad? I don't want to give up on all exercise because I won't let this beat me. What knee brace would you recommend for me if I were to try snowboarding? I know it sounds extreme but hey we only live once right? I had ACL reconstructive surgery back in the end of February, and I'm about to start to ease myself back into basketball season. Will this be a good brace for me? Yes you can wear the SE 4 for playing basketball after an ACL surgery. I have a minor ACL tear as well as some articular cartilage damage. I am also a competitive cheerleader. Would you recommend this brace for me? This brace will help with the problems that you are having with your knee. I had an ACL reconstruction surgery in March and I'm pretty close to being released. I'm a high schooler and play basketball year round. Would this be a good brace for me? The SE-4 Knee brace is for ACL injuries so you should be good wearing this while playing basketball. I have an LCL injury and baker's cyst on my left knee. I'm a dog trainer and need to wear it for stability. I currently have the Reaction knee brace, which is good but gets hot outside. Would this be a good brace for me and which compartment should I order? Is this the proper knee brace to purchase for a high school football player (linebacker) that suffered a hyperextended knee injury? My new brace is a uncomfortable under the hinge on my outer knee. Does it take time to get used to wearing it? The ACL strapping would be advised for a meniscus tear. I play football as an offensive lineman, and looking to get knee braces to help protect me. I only plan to use these for one season, and I am trying to not use as much money. Could I still use these or would these not last and I should go for the Armour. will this brace help with my knees hyperextending ? Yes, the DonJoy SE-4 Knee Brace will prevent hyperextension. It comes with a 10deg extension stop installed in the hinge. My left knee is unstable due to several meniscus injuries, detached ACL, and just plain life over the years. Under controlled conditions (working out at the gym or bicycle riding) my knee supports my exercising. However, I have been doing short mud runs and obstacle courses. My knee is deteriorating because of them but I am not ready to stop. What braces would hold together doing a Tough Mudder and support my knee? I am an active 30 something lady that had ACL reconstruction surgery in February and I am looking for a brace to be able to ride horses, four wheelers, and throw a ball with my grandson. No high impact sports just a Zumba class and maybe some insanity work outs. Will this brace be enough support and will it be easily cleaned and cool? Yes the Don Joy Se 4 Point will give you protection for the ACL during all of the activities that you would like to do. I seem to fall between a medium and a large...which do you recommend? In order for you to get your knee into the brace you will have to go with the large size. The fram is malleable so you should be able to squeeze the thigh cuff to make it a little tighter on your thigh. I tore my ACL and meniscus about 10 years ago and was wondering if this brace would help me out with weight lifting? I also play paintball on occasion as well. My thigh is 20.5 in, knee is at 16in, and calf is at 15in. What size would be best as well? The this brace will work for you during wieght lifting your measurments have you at a medium with the thigh and calf but a large at the knee. I would try the medium, but it may bee too tight. A large will be too big on your leg and will most likley fall down. I detached my ACL while skiing and tore my medial meniscus many years ago, I did not have surgery, just therapy which worked great, however I've recently begun running for exercise and need some support for my knee (it has been known to pop out of place since I began running) - which of the configurations do you recommend? Would the ACL or the CI be the best option? I would reccommend the CI strapping. Well I was looking for another brace that was less expensive than the full force brace (which I have) I love that brace....I loved it so much that I wore it out. I'd get that brace, but it might be a little pricey for me right now. Any who... This is for my other knee. I have patella tracking disorder. Its torn up my knee and I will be having surgery in a few months. Until then, I need a brace thats going give me stability. My knee is starting to give out on me.. I've also got a loose fragment floating around in there.I have arthritis too. Is this brace good for ligaments and keeping knee parts where they need to be? I need a brace that's going to work for me now and until after I get my knee fixed. I like these Braces because they don't weigh me down. I hate neoprene at this point. I work in theater/ live productions and around horses. This is why I like heavy duty braces. The SE 4-Point provides the basic frame of the traditional legend at a fraction of the cost. It is ideal for moderate to severe ACL, and/or PCL, MCL and LCL instabilities. The outer coating provide a protection layer to the frame for contact. I have a small meniscus tear and minor case osteoarthritis my Physical therapist suggested that wear a knee brace when engaged in athletic activities. Can I wear this brace for the Spartan and Tough Mudder obstacle course races and martial arts practice? Is this brace good for tennis or volleyball? will the patella pull attachment work on this brace? I just got sugary on my knee and its still unstable and loose. I got it cleaned up inside of my knee what brace option should i order? Hi , Just wanna ask is this the right braces for me?.. last week i have a meniscal tear and just wondering. I'm still in the process of healing. just wanna know, am i able to go back to my previous skills with this brace or what brace suits me , even though i won't have to do surgery..or surgery is a must for meniscal tear? should i need to do surgery before using this brace? thanks in advance! Hi there, just wanna ask. i recently have a torn meniscus on my left knee and don't want to have surgery. I still want to play basketball without being re-injured. is this braces can help go back from previous speed on the game and also jumping, i kinda jump high you know, so i'm also kinda worry that my game will change. can i still be that much on the game even though i have torn meniscus and not to mention i also have torn acl on my right knee 6 years ago and it's healed on it's own. You should be able to play basketball in the brace. It should not slow you down or affect your jump, however your meniscus tear may do that since you are choosing not to get it fixed. which configuration would be best to order with needed MCL support. Should i choose the CI or the ACL configuration? The ACL configuration will give excellent support for your MCL issue. The CI is used for ACL and PCL issues. I am looking for lock out plate to restrict bending to 90 dgrees and Double D clips to add additional strap to my brace for additional support. Is this spare parts available? I am in my fifties and both of my knees are artificial. I have been in martial arts for many years. My question is: Will this brace help protect my artificial knees when kicking. Thank you for your question. This brace will add stability to your knee joints. If you feel laxity or have hyper extension concerns this brace would be a good fit for you. Hi, I am a football player and I have had knee braces in the past. But they all fit on the outside of my pants. Will the SE-4 fit on the outside and if so will I knee to get a bigger size to make it fit on the outside? Hi I was wondering if the small middle piece of the knee brace protects the patella really well? Thank you for your question and your service. This brace can be worn for your diagnosis and activity level. It would be suggested to call customer service to place the order on this brace. Some of the sizes/strapping types are on back order so it would be best to verify the one you need could be shipped out right away. I have a right LCL injury. Is the ACL knee compartment the best choice? I'll be using for softball and golf. I had surgery on my meniscus and instability in my mcl would the SE-4 be a good choice for me seeing that I play softball, if so what option would I chose for this brace? Thank you for your question. The SE-4 Knee Brace is designed for contact sport for a person with your injuries. You may also look at the Armor if you do a lot of sliding. It is a thicker brace and can withstand more pounding that the SE-4. I play lacrosse and i am in need for a more advanced brace and i was wondering which you would prefer for me to get. i have a partial acl tear and a past mcl tear. and is the se-4 any different from the fullforce ligament knee brace? Thank you for your question. The FullFource and the SE-4 are both rigid frame braces that use the 4 points of leverage position the tibia and the femur to better protect your knee. Both braces can be worn during contact sports which would make them good options for you. The SE-4 only comes in one length, standard. It is 16" in length and comes with a 6 month warranty. The FullFource has a 1 year warranty on the frame and hinges. It also has a Fource Point hinge which is an added feature to protect the ACL. The fullFource come in 2 sizes, standard at 16" and short calf option which is 15". If you have any questions about these products please don't hesitate to call us. I have had an incomplete tear in my lateral meniscus and have had knee problems over the last 4 years with re-injuring back and forth. I play basketball often and go skiing several times each year. Would this be the brace I should get for my needs or should I look at another like the playmaker II? The SE4 would be fine for playing basketball but the length of the brace is 16" so it might not fit with ski boots. If you want a rigid brace that will fit the Armor would be able to do that becuase you can get it with a short calf. A shorter soft hinged knee brace will do the trick as well such as the Deluxe hinged knee brace. how much does this brace weigh? My son had acl reconstruction and? meniscus surgery as well. He is a wrestler in high school. Are these braces allowed in wrestling competitions? To be sure you should contact the coach and ask him the rules but, he may be able to wear it with a sports cover on it. This brace has some malleability to its frame. However, if you have had large amounts of mass gain you may want to get a larger brace for a more comfortable fit. The SE-4 is a fairly light weight brace. It is not uncommon for athletes to wear this brace. If you have an ACL injury you may want to look into the FullFource as an option. Thank you for your question. For a MCL injury you will want a brace with hinges so the SE-4 will give you that support on the medial aspect of your knee. This brace will also give you our four points of leverage that will isolate and anchor your femur and tibia in a position that adds security to your Ligaments. You may also want to look at the PlayMaker 2. The PlayMaker 2 with FourcePoint hinge is a great brace for noncontact sports. Thank you for your question. Please let us know if you need any more assistance. Is the Legend SE-4 recommended for skiing? I need a brace as a free-skier and active backcountry ski guide, who wears a brace sometimes continuously for 8-12 hours at a time. Any input is greatly appreciated. I have torn up meniscus and ligaments in my knee and need a brace to wear at work. Do any of the hinged braces fit nicely under clothing? The Fullforce is a low profile brace that fits under clothing, so does the ACL Everyday. Is this a good brace for knee injury prevention? I am a football lineman and want extra support to protect my knees from major injury. Thanks. This has the same support of all of our rigid hinged knee braces, because of the material used it may not withstand the punishment of a lineman, this is why we recommend the Armor, our most rigid framed brace and used by 21 of the 25 BCS football teams for their linemen. I have had multiple surgeries on my meniscus to repair latitudinal tears. I also had ACL reconstruction several years ago. I'm told that all of my ligaments are extremely loose causing more instability - and that along with a small meniscus tear leaving it almost impossible to repair again as I'll most likely just continue to re-tear. Both of my knees hyperextend as well. I have the most instability when swimming or doing activities where my knee is bent / hanging. I need something that's more of an everyday brace for any activity. Not sure if this is the most appropriate brace or not, but the fact that I can wear it in the water is what interests me the most. Any advice would be helpful. You can wear any one of our braces in the Water, we recommend that you rinse when you exit the Ocean/Pool. I recommend the Full-Fource, its the lightest ACL brace we have. 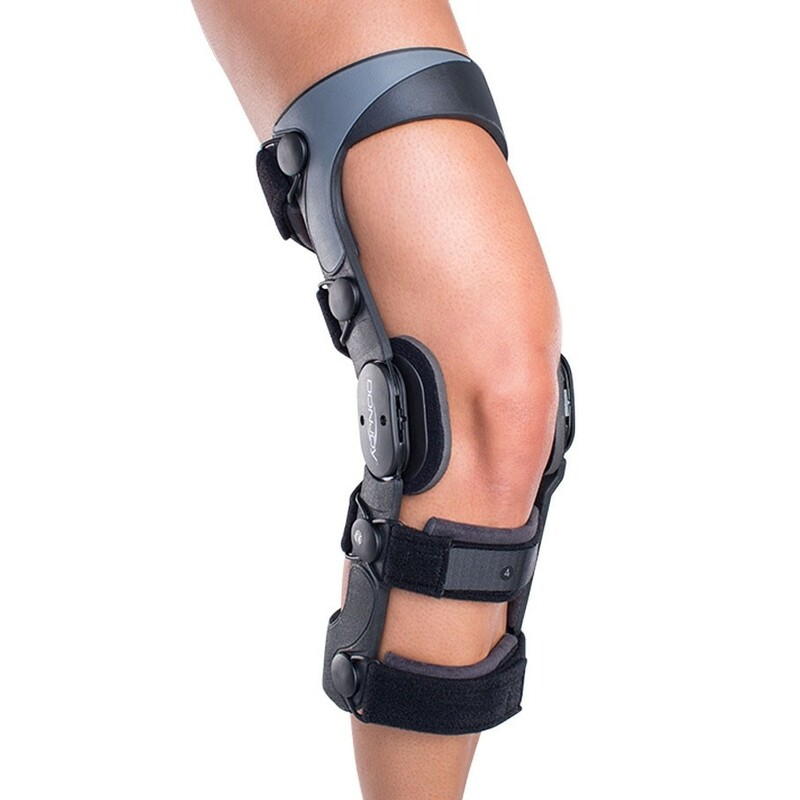 This brace features the FourcePoint Hinge which provides additional ACL support. You are also able to insert Extension Stops if needed to protect against hyperextension. Are the braces marked right or left? If so where are they marked? Yes the brace is labeled. Pull the thigh liner away at the edge, you will see the size, and left or right label on the liner. Does the SE have support to give some relief of some OA symptoms. Im a basketball player who has had an ACL reconstuction in 2008. And im have some OA discomfort. The Dr told me me that had some OA going on when i got my surgery. I recommend an OA brace. Take a look at the OA Fullfource, it's an OA brace and ACL brace. This brace will take the pressure off the injured meniscus. 1. Is this a double upright brace? 2. Does this brace assist with prevention of knee buckling? 3. Do you have a recommendation for cost effective double upright brace for an elderly person with both knee buckling and hyperextension. Take a look at the link below for Rigid Knee braces, these all have a medial and lateral uprights. If you are looking for a Soft Knee Brace with Medial and Lateral Uprights take a look at the deluxe hinged knee, this is available in wrap around style, easier for an elder to apply. Can you add Flex/Extensión stops to the SE-4 Version of the legend? You say it has an instaled ext stop at 10 degrees? Yes extension and flexion stops can be added to any of our off the shelf rigid hinged knee braces. All of our rigid hinged knee braces come with a 10 degree extension stop installed. I am an active guy playing baseball and working out a lot. I hurt my MCL playing football and am looking for support. My only thing is I'm a catcher and I don't know if this would fit under my shin guard and if it would allow me to get into a full squat. Could you let me know if this would limit me catching? You have Full Range of Motion in all our Off the Shelf Bracing. Selecting a Brace depends on the level of activity you are participating in. For Baseball Players I would recommend the Armour, its the strongest frame on the market, stronger than our Custom Defiance Brace. It's intended for contact sports like football, soccer, where their is lots of contact and sliding. Since you are a catcher and players will be sliding into you I recommend the Armour, FullForce, or 4titude, these have a sleek design. The SE4 is a little thicker in the Frame, but you may be able to get this brace under your shin guards. For soccer You should look at the Armor it is our most rigid off the shelf knee brace and can handle the physicality of soccer. Or the FullForce, they will be able to handle sliding and the physical pounding the brace will take. I have ruptured ligament on inside of knee, will SE 4 be OK? My knee is 8 weeks post surgery 44,5cm, will large be able to fit? My thigh and calf is 48,0cm? Thank you! Yes the DonJoy Legend SE-4 will provide appropriate support for your knee ligament. Currently your knee measurement is a size XL. You stated "My thigh and calf is 48,0cm" - did you forget the thigh measurement or is your thigh and calf both 48.0? Your calf also measures an XL, however if your thigh is 48.0, then it is a medium. I would recommend an XL to you. I play football and recently suffered a torn meniscus and my ACL is REALLY unstable. Would this knee brace help stabalize my knee and protect it from future injury? Thanks. Yes, this brace will assist in supporting your ACL as well as overall knee stability during activity. However, if you are looking for a brace to use during football, we recommend the DonJoy Armor as it is has a more sturdy frame and made to withstand more sheer blows to the knee. It is designed for high impact and collision sport athletes. This brace can be worn to support your ACL for activities, however in higher contact activities such as jiu jitsu we recommend the DonJoy Armor, designed for more collision, high contact sports. The Legend SE-4 can be worn during your chosen activity and will provide the appropriate amount of support you need. I'm a defensive back on a women's football team. I have instabilities on my left knee including hyper extension and mcl and acl. Would this brace be sufficient or should I move up to the armor or full force? Because you are an athlete who plays football, we recommend that you go with the DonJoy Armor brace. This brace is a bit more durable and designed for athletes in collision sports (such as football). It will provide the appropriate stability for your needs. Is this brace best for ACL post-op surgery? 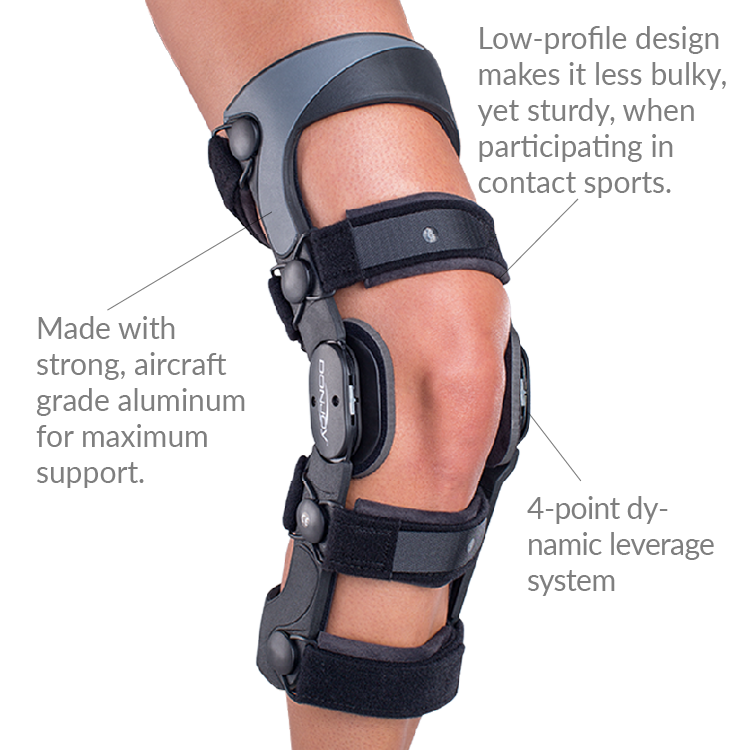 All of our rigid knee braces have the 4 points of leverage system design which aids in ACL stability. The durability of the brace would depend on what activities you are planning. I was wondering can I wear this brace while I go swimming in the ocean? how many hours a day can you wear this? The product can be worn as long as needed. I am looking for a brace to wear while water skiing. Will this brace hold up being in the water? Any special care instructions? Thanks. Yes it has a rubberized Kraton coating to protect the aluminum frame from rust and corosion. Simply rinse with fresh water after each use and air dry. Can this be worn over slacks? The braces are not really designed to be worn over clothes, as it can cause the brace to slip, or the pants to get bunched up in the frame. Wear it directly on the leg if at all possible. Your options are pcl, ac, or cl for knee compartments. What does this mean? PCL=Posterior Cruciate Ligament, ACL = Anterior Cruciate Ligament, CI = Combined Instability (PCL & ACL Tears), Knee Compartment = Medial or Lateral Joint Line Osteoarthritis. Is the CI version for the MCL? What is the difference between the Legend SE-4 and the Legend? The CI version will address both ACL and PCL. The Legend SE-4 is the same as the Legend, but with an extra set of pads and liners. Is this model also made of Aircraft aluminum? Yes, but it also has a Kraton coating to protect from chips and damage. Bought this for my junior year because i injured my knee during my sophomore year and have a meniscal tear making my knee unstable. While being a lineman i know that our knees take a lot of abuse and a brace like this is needed. I'm really happy with it, it's very comfortable, decent weight, and stays in place. And it's a good value for a knee brace if you are tight on money. Bought my donjoy se-4 four years ago due to acl and meniscus tear , thanks to it I can play soccer and basketball without worry but need to get the right size as I've bought one above my size which gave me some problem. Slight issue I have with it is when i sweat it has the tendency to slide down. Have been playing soccer all my life I tore my acl and decided to buy this product a year later to start playing soccer again. It's so big I can barley run in it let alone do any type of dribbling or cuts. I understand it's supposed to protect your acl but to not have any type of movement? Cons: Huge. Bulky. Can't run. This brace gives my knee the stability and support it needs to do my job. I work in a small package environment, and need my full range of motion. I squat, climb, speed walk, and carry bulky and heavy items. I tore my acl a few months ago, and with Physical Therapy, and a lot of hard work, I haven't had to have surgery. I still have weakness in the joint, but wearing this brace has allowed me to return to work without limitations. Excellent design, more comfortable than any other brace I have worn, and once you get used to putting it on, easy to wear. Bought these for my son who is a High School Freshman. He tweeked a knee in baseball and it followed him to the football field. He plays offensive line (center to tackle as needed) and figured braces were chheaper than surgery at this stage of his life. The initial difficulty with fitting was resolved by the school trainer. He had no problems with mobility, and after a week can barely tell he has them on. He took a couple of hard hits directly to and below the knee with no complications. I would highly recommend these braces for HS Football and possibly on to College. My ACL snapped and my PCL tore. The doctor saw the meniscus damaged. I had non-refundable holiday all paid up. I bought the brace and it has been wonderful. It allows me to play tennis as if I had no injury whatsoever. I gained my confidence bit by bit and I am also walking and bicycling. Pros: It is great for sports where I have to run and twist without worrying my knee will wobble. Cons: I cannot use it for other type of activity like mat Pilates or Yoga, as when I hit the ground, it just moves out of its place. I wish I could use it for both tennis and Pilates. I was surprised how well-made it was for the price. It fit nice and solid, did not migrate even a quarter inch. Pros: Craftsmanship was top notch. It fits better than my old prescription 1000 dollar brace ever did. Just a little tight. Cons: Finicky stuff...longer straps. The calf and the behind the thigh straps were about an inch too short. I had to raid my old brace for its straps, and there you go...just fine. Perhaps better condyle pads and perhaps a slightly wider "quad cage." Cons: More videos of kind of movements not permissible or not advisable per brace will be helpful in quick decisions and purchase.